The first idea of an exit game originated from Japan. In 2004 a computer game was developed in which the players are locked up in a room and have to try to get out. 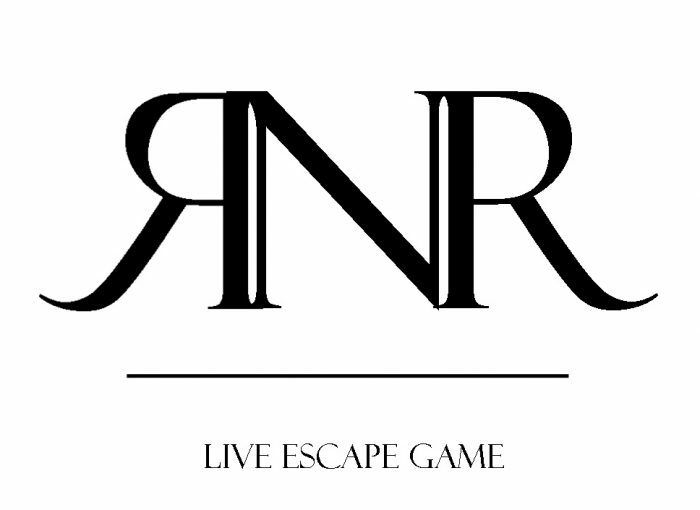 Since 2007 there have been real live escape games. And here’s how it works: within one hour a small group of people have to solve many riddles to get out of the room. For some time now this has also become a trend in Germany. Our Lord Mayor and his team at the last riddle. The secret society “Aegrum” threatens our beautiful city with a mutated plague. If it is not neutralized in time, everyone within a radius of 20 km will be in danger. That’s why brave people are sought to sneak into the secret society’s headquarters. They have to find the only antidote that exists, locate and neutralize the plague, all in 60 minutes. There are many puzzles and traps on the way, all of which must be overcome to get to the final destination. 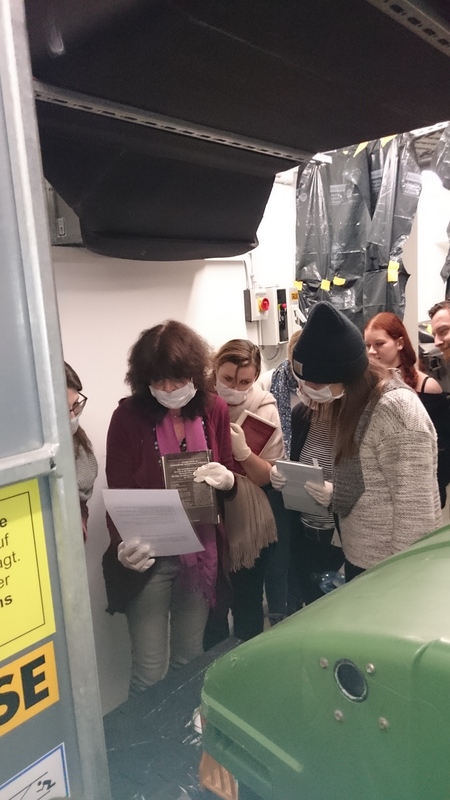 The tricky puzzles took the participants through the whole premises of the City Library and Kunstpalais, what made the Live Escape ROOM more of a Live Escape HOUSE. All tasks were solved with bravura and everyone had a lot of fun. Even our Lord Mayor took part in it. Of course, he could protect Erlangen from this danger. 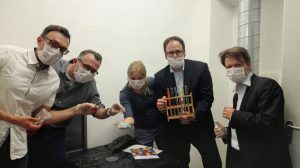 I do not want to fool you: The creation and execution of a Live Escape Room is time-consuming, no question, but on the one hand, the creative work is a lot of fun and on the other hand you will attract a completely different target group to your library: people, who, as was in our case; had nothing to do with the library or the Kunstpalais before. But why did it actually become an escape house? For fire protection reasons almost all doors in our building cannot be locked. Our solution to the problem was a kind of scavenger hunt that culminated in a large final task (in our case, the neutralization of the pathogen – another possibility: the participants eventually come out of the house, perhaps through an unknown staff entrance). 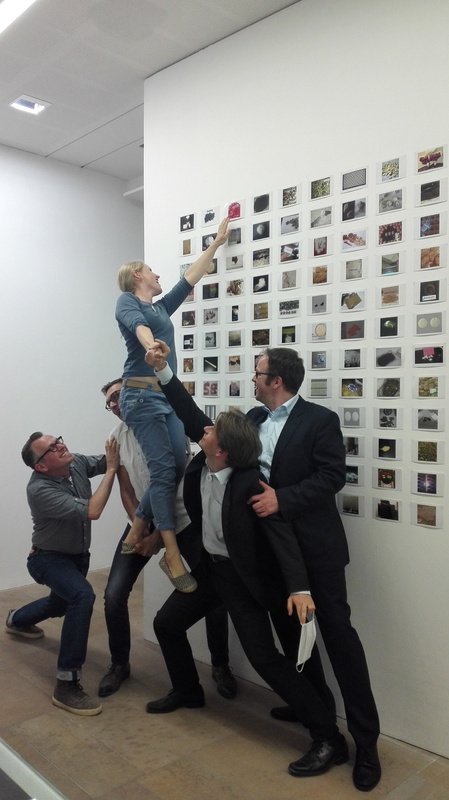 The project team included seven people (three colleagues from the Kunstpalais and four from the library). So you can also rely on the creativity of several people, which can be very important in a project of this kind. Now it’s going to be crazy! Then the creative work starts! Think about a story, whether in the future or in the 50s, anything is allowed. Maybe there are special circumstances that you can use. 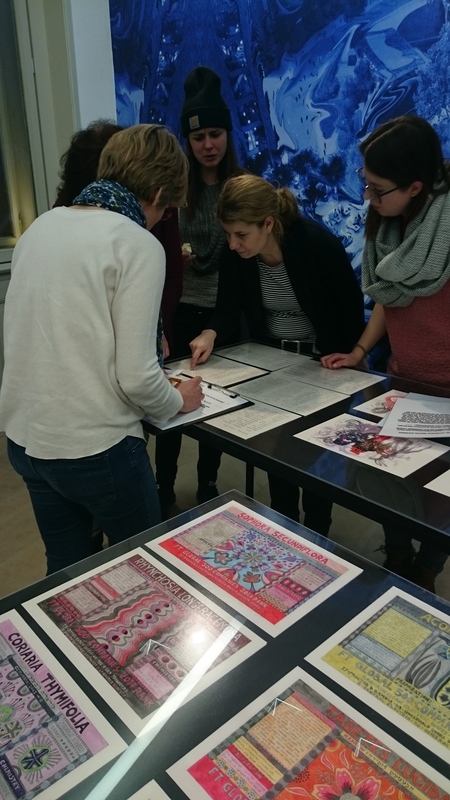 During our Live Escape Room, an exhibition on substances and drugs took place in the Kunstpalais, which suited our theme of viruses, pests and antidotes perfectly. Then you have to think of a route. We also tried to include places that users normally do not see, such as: our closed stacks, the garbage room or our hidden spiral staircase. Next up are the puzzles. Which riddles? Where are they placed? And how do the riddles help the particpants on their way? During the whole planning you always have to keep the time of 60 minutes in mind. The route should be feasible but not too short. Remember, the participants need time to puzzle, run and orient themselves (users usually see the facilities from a different point of view). Now that you have worked out everything and are totally satisfied, then do several test runs, e.g. with your colleagues and friends. They can give you useful feedback to help you optimize the route. At the end of each run, we offered drinks and snacks, so we could talk to the participants and ask them for some feedback. We have already received a lot of good suggestions, e.g. 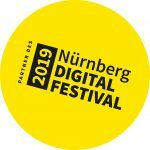 the integration of digital elements such as VR glasses or augmented reality or a small photo souvenir for the participants. Well, now you have an idea how the whole thing worked out for us. If you have any questions feel free to contact us. The team of our Lord Mayor is looking for the next riddle. Partizipants try to solve a riddle. Nächster Beitrag Und was hat das mit mir zu tun?